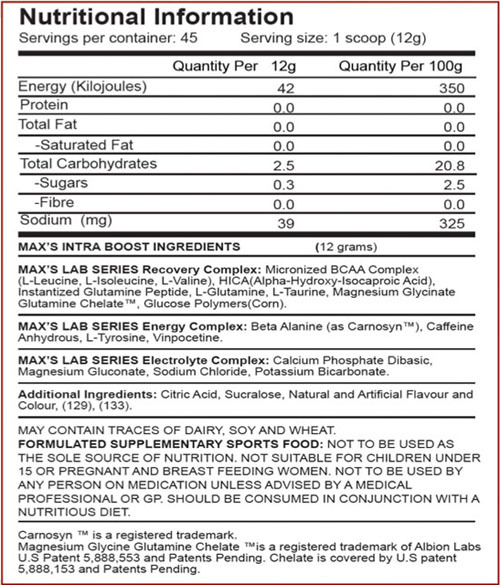 This product contains the three branched chain amino acids Leucine, Isoleucine and Valine. These amino acids are classed as Essential Amino Acids and are incredibly vital for muscle gain. By using this product, you prevent significant muscle breakdown otherwise known as muscle catabolism. This means you will be able to recover quicker and significantly reducing muscle soreness for the following days. You will also gain a tremendous amount of energy through the nutrients it provides, which will greatly reduce fatigue throughout the day when consumed and through your workout. 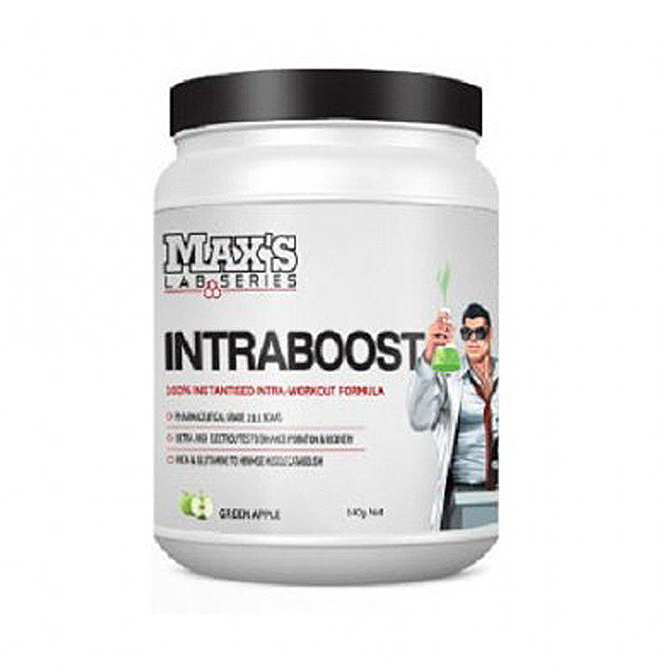 Max’s Intraboost is a new formula which is a potent vasodilator and provides hydration, energy and enhances cognition. This exceptional workout formula maximises workout potential with branched chain amino acids, beta alanine and Hydroxy isocaproic acid. Intraboost is perfect for those who experience a lack of motivation when it comes to the high intensity workouts. Intraboost provides some highly beneficial effects on the human physiology which contributes to helping to achieve the ultimate workout and accomplish goals. This product enhances blood flow to channel more energy into muscles, reduces the build-up of acidity from muscle contractions and enhancing muscle endurance. BCAA’s: This product contains the three branched chain amino acids Leucine, Isoleucine and Valine. These amino acids are classed as Essential Amino Acids and are incredibly vital for muscle gain. Valine: Is an essential amino acid that assists in the prevention of muscle breakdown because it provides the muscles with additional glucose required for energy production. Isoleucine: Is an amino acid which enhances endurance and assists with muscle recovery. Leucine: Is an essential amino acid important for various metabolic reactions and protein synthesis. This amino acid regulates blood sugar levels, enhances growth and promotes the recovery of bones and muscle tissues. Glutamine: Amino acid used in the biosynthesis of proteins and is also important for providing energy to many different cells in the body. Glutamine is also used to manufacture other amino acids and glucose. helps sustain a positive nitrogen balance which enhances health and exercise maintenance. It also has other vital functions in the body such protecting and supporting the digestive and immune system. It is also one of the crucial energy sources for the brain. Taurine: Is an amino acid which can assist with enhancing mental focus and clarity which is perfect those wanting to reduce their body fat percentage whilst reducing the side effects. Taurine also acts as a testosterone booster to increase the body’s ability to put on lean muscle and fight free radicals which helps to build good, strong and solid muscles. Beta alanine: Is known as a non-essential amino acid which is converted inside the body into a natural chemical compound known as carnosine. Carnosine has an important role in normal functioning of the body including the adequate functioning and development of the muscles, heart and many other organs. Carnosine increases physical endurance by providing electrical nerve signals to the required muscle groups. The fundamental role of beta alanine once conversion has occurred is to provide a barrier and reduce the accumulation of acidic residue during a workout. This assists in the reduction of lactic acid accumulation which contributes to a reduction in muscle fatigue. Beta alanine is the compound that causes the tingling sensation experienced after consuming a pre-workout. Caffeine: Is found naturally in tea, coffee and chocolate where it also comes in supplement form. Caffeine enhances mental alertness, reduces drowsiness and improves coordination. Vinpocetine: Is an alkaloid derived from the periwinkle plant that is utilised in the treatment of epilepsy and cognitive decline. The functions of Vinpocetine include neuroprotection, reducing inflammation and protecting the cardiovascular system. L-Tyrosine: Is categorized as a non-essential amino acid which is found in most proteins and metabolically synthesized inside the body from an amino acid known as phenylalanine. The supplemental form of Tyrosine contains acetic acid which enhances the bio-availability and absorption rate. N-Acetyl L-tyrosine is the most commonly used form of supplement tyrosine due to the bio-availability. Tyrosine has an important role in the production of epinephrine and norepinephrine which are two hormones that regulate the bodies stress responses. When the body experiences stress, its ability to naturally synthesize tyrosine is inhibited which may result in a deficiency. Tyrosine supplementation may decrease the risk for deficiency and enhance performance and memory when the bodies under stress. Tyrosine is also required for the synthesis of brain chemicals such as serotonin. Serotonin is a neurotransmitter which is known as the happy hormone because it enhances mood and restful sleep. Calcium: Is an essential nutrient in the body which has an important role in supporting healthy bone growth and strength. Adequate levels of calcium are required to be maintained inside the body fluids and tissues to ensure the body’s important biological processes can function efficiently. The muscles depend on calcium for muscle contraction and is utilised during the secretion of enzymes and hormones. Magnesium: Is an essential nutrient required by the body for several biological processes. Magnesium plays an important role in stabilising the heart rhythm and is a significant component in the formation of teeth and bones. It also has an important role in protein synthesis and produces protein which are transformed into collagen. Magnesium is also required to absorbed calcium. Sodium: Sodium is an essential mineral which contains an electrical charge known as an electrolyte. Electrolytes facilitates muscle contraction and nerve impulses. Sodium ions generate nerve impulses and muscle contractions when they shift across cell membranes. A nerve or muscle cell contains positively charge potassium ions inside the cell and is surrounded outside the cell by positively charged sodium ions and negatively charged chloride ions. When stimulated, potassium ions flow out of the cell as sodium ions rush in. This creates an electrical signal of the nerves and muscle contraction. Potassium: Is required for all living cells to function efficiently. It is the major cation (positive ion) inside cells and has a fundamental role in maintaining fluid and electrolyte balance inside the body. Use 1 (one) scoop in 600mL of water “during” the workout (intra-workout) and anytime throughout the day when required for extra recovery. To maximize results, this product can be used additionally before workout and post workout training to increase muscle recovery time.